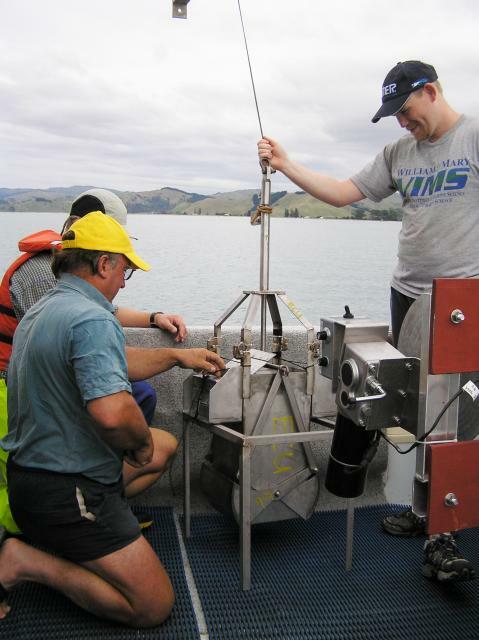 NIWA and VIMS personnel inspect a Gomex box core device during February 2010 fieldwork. Box corers descend to the seabed under the weight of gravity. They are rectangular in shape as shown inside the metal frame legs, and are designed to collect a large volume of sediment from a relatively large surface area. Rotating jaws, also seen in the photograph, close off the bottom of the box after it enters the sediment. Penetration is usually limited to a few 10s of centimetres. Image courtesy of MARGINS post-doctoral fellow Tara Kniskern, VIMS.